// Happy hump day!!! I am so excited to share this super easy, yet also super yummy healthy recipe that I made for dinner last night! It's been a while since I've made a truly healthy meal around here that the entire family loved, so I knew this was something I had to share! The kids ate their tacos in a soft shell instead of a lettuce leaf, because let's be real, if it looks healthy Carson isn't getting near it...ha! // And last, because it's always easier to get motivated with some new gear, here are my gym favorites from the Nordstrom Anniversary Sale! And don't forget, it opens to the public in two days so if you are a cardholder and you see something you like, grab it now! 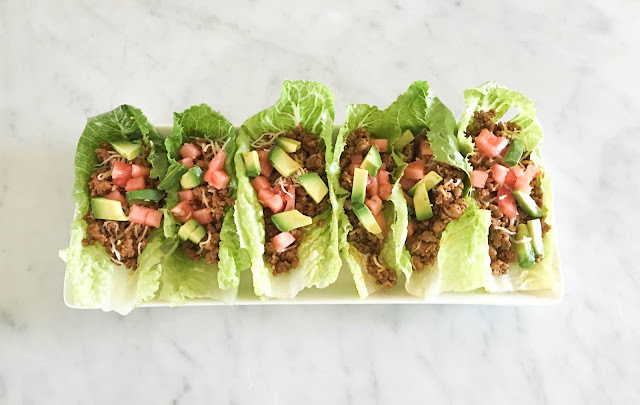 We love lettuce wrap tacos in this house, so yummy! Love those workout gear picks too, I can't wait to pick running back up and explore DI.